Stay away from Kaamil Mahmoud on Facebook! The malware analyst team of Emsisoft has detected a new wave of fake Facebook emails leading to malware contaminated websites – and being careless could infect your computer with the Zbot trojan. Emsisoft has revealed that cyber criminals are making use of the Friends system to infect users with malicious software. 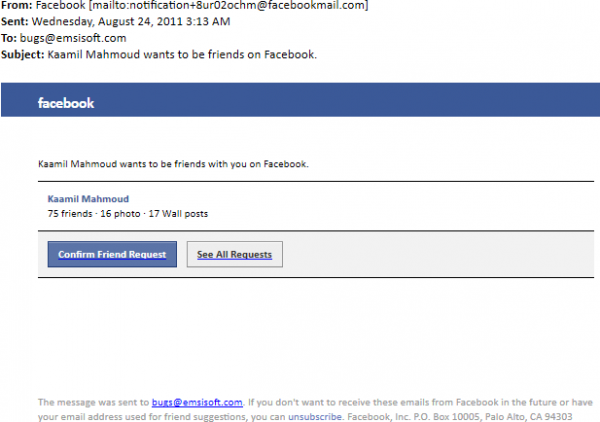 One very common friendship request going around is from a fictitious Kaamil Mahmoud. So if you get a Friends request from him, you dont want to accept it! If you do, you may be led to a fake Facebook website as soon as you click on the “Confirm Friend Request” link. The fake Facebook page shows the message “Your version of Macromedia Flash Player is too old. If you make the mistake of clicking on ‘Download and install the latest version of Adobe Flash Player’, your browser will download a malware file named updateflash.exe which contains the Zeus trojan, also known as Zbot. Even if you dont execute the file, you cannot escape infection now. 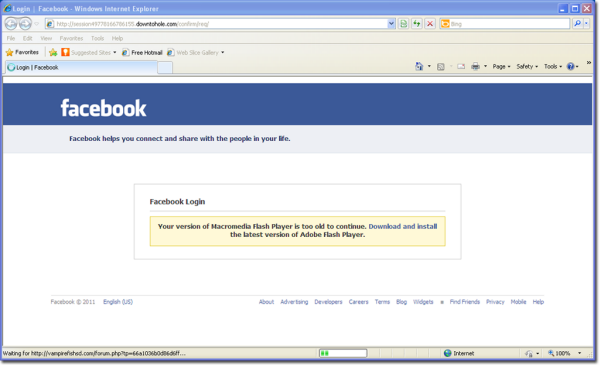 The fake Facebook page will also load another address in the background and run an exploit script in the background. Says Christian Mairoll, CEO at Emsisoft: We advise people to update their operating system and all applications regularly, including security programs. Second, everybody should be careful with suspicious emails: those from Facebook always contain the name of the user and all links point to the legitimate Facebook website, of course. The safest way is to open Facebook manually in the browser and have a look at new friend invitations there. If you are looking for ways to stay safe while using Facebook, go here. Why would you accept a random unknown guy’s Facebook request? This is so good.. I like the way he has the approach to attack. but what he is doing is not appreciable…. Christian Mairoll is a coward. His software is a failure. He must apologize.